Posted on March 6, 2018 at 5:37 am. Read any good books lately? The “Talk about Books” Club” — a.k.a. TAB — will be meeting TODAY during all grade level lunches in the library. So grab your grub and come take a look at these Totally Awesome Books!! The Kindness Club will be meeting TODAY during ASP 1 in room 134. All are welcome to attend, even if you’ve never attended before. Participants will be brainstorming ideas for the Spring semester — and the more ideas the merrier. See see Mr. Johnson, Ms. Zeller or Ms. Schaefer with any questions. Need help with Spanish? The Yorktown tutors are coming back — TODAY during ASP 2 in room WW 5. Get extra help with grammar, vocab, and everything you need to succeed! Just sign-up with your Spanish teacher ahead of time to attend, or see Senora Stewart with any questions. Hasta pronto! Sister Circle will be meeting on THURSDAY during ASP 1 in room 233. Members and allies are encouraged to come out for a little Girl Talk — and a lot of fun activities! There will be a special guest speaker this week — so don’t be late. See Ms. Cameron with any questions. All middle school boys are invited to the upcoming APS “Color of Leadership Conference — Find Your Superpower!” — on Saturday, March 10th from 8am to 2:30pm at the Arlington Career Center. This exclusive program includes leadership workshops, roundtable discussions, mentoring, and of course FREE FOOD!! Interested boys MUST register for the event by this FRIDAY. To sign-up or for more information, see Ms. Cameron or go to the main office. Boys rule!! Jump aboard the College Awareness Bandwagon! WMS is holding a door decorating “college competition” this month. Just find out your TA teacher’s alma mater — that means what college they went to — then decorate your TA door with their college colors, the mascot, and at least 10 fun facts about the school. The Student Services Staff will select the best college booster from each grade — and award Wolf Paws to the entire TA!! Judging begins in TWO weeks, so get decorating, Wolves!! 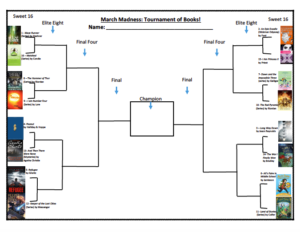 The March Madness Tournament of Books is underway! Make your picks for the Sweet-16 — then vote using the QR code located by the cafeteria, or follow the link in today’s Morning Announcements Blog. There’s a lot of great books out there, and may the best book win! !